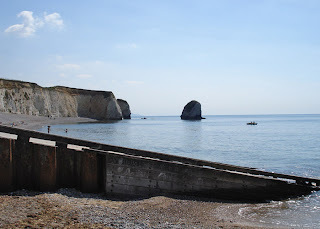 We have been relaxing and holidaying both at home and on The Isle of Wight. It has been wonderful just to switch off and be with the family. We returned to the Isle of Wight and hooked up with friends and the girls met up with their penfriends (also made last year). It was great to have no plans and just to see what each day brought. We were so lucky as the weather was glorious.. suntan lotion and sun hats all week! No... we just let the days unfold and had a few beach days, a few sightseeing days and time just hanging out together and with friends. 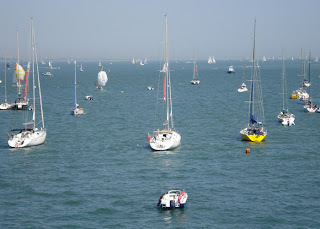 We saw lots of yachts as it was Cowes week. 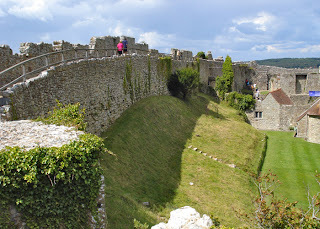 We walked around these walls at Carisbrooke Castle. 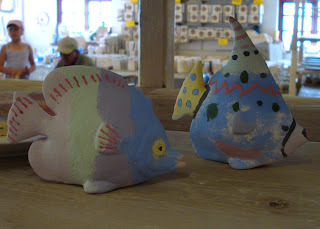 Painted these at Chessell pottery. 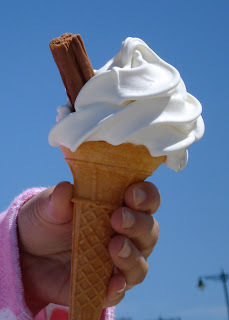 And enjoyed an icecream or two. 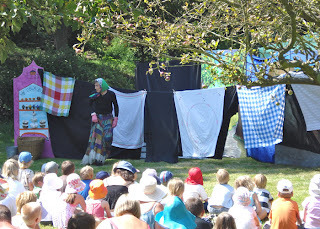 We also saw this open air performance of the Pied Piper at Mottistone Manor with our good friends. We took a picnic and the boys went off to the NT cafe and came back with tea in china cups .... .. sipping tea.. on the lawn.. in the sunshine.. what bliss! So i am now so rested that i'm mostly horizontal. 3 more weeks left of the Summer hols then back to reality. How i wish everyday could be like Summer. We have a few new projects on the go at the studio and at home we are harvesting courgettes.. although some of them are now marrows due to the recent rain! Hope you are having fun wherever you are! I sounds like a wonderful holiday. We stayed on the Isle of Wight when the boys were very small in a NT cottage right next to Mottistone Manor. Sounds like a fab holiday, you can't beat a couple of weeks off in the sun. Glad the weather was good seeing as you were camping, a must when under canvas! P.S. We came back to loads of courgettes and marrows too, so I took myself off and bought the new Sarah Raven cookbook, worth every penny, and loads of recipes for courgettes and marrows! What a great way to spend your holiday. It looks like the sun was shining too! Enjoy the remainder of the summer holidays. I have been for a walk this morning and it already feels like the season is changing. Back again to say I have nominated you for a Nice Matters Award. The details are on my blog. That looks like a wonderful holiday. I will visit you again, as your business sounds wonderful. 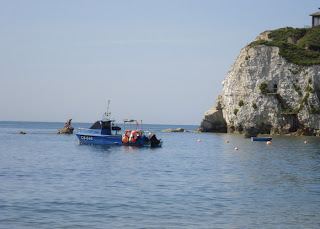 I've had lots of good reports of fantastic holidays on the Isle of Wight this year. Glad that you enjoyed yourself and had a well deserved break after all that selling! Never been to the IoW, though this makes it look very tempting. Definitely courgette madness month, ours are breaking into the house!